The Winnipeg Free Press is a daily (excluding Sunday) broadsheet newspaper in Winnipeg, Manitoba. It provides coverage of local, provincial, national, international, sports, business, and entertainment news. Various consumer-oriented features such as homes and automobiles appear on a weekly basis. The newspaper's main competition is the Winnipeg Sun, a print daily tabloid. 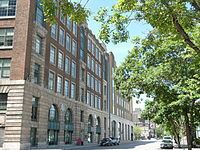 Founded in 1872 as the Manitoba Free Press, it is the oldest newspaper in western Canada. It has the largest readership of any newspaper in the province and is regarded as the newspaper of record for Winnipeg and Manitoba. The newspaper's existence began only two years after Manitoba's joining of Confederation in 1870, and predated Winnipeg's incorporation in 1873. November 30, 1872: The "Manitoba Free Press" was launched by William Fisher Luxton and John A. Kenny. Luxton bought a press in New York and he and Kenny rented a shack at 555 Main st, near the present corner of Main Street and James Avenue. 1882: Control of the Free Press was passed to Clifford Sifton, and the paper moved to a building on McDermot Avenue. The organization remained there until 1900, when it moved to a new address on McDermot, at Albert Street. 1901: John Wesley Dafoe served as editorial writer, editor-in-chief and president until 1944. 1905: The newspaper moved to a four-storey building at Portage and Garry. 1913: The newspaper moved to 300 Carlton Street and remained there for 78 years. 1920: The Free Press took their newsprint supplier before the Judicial Committee of the Privy Council for violating the World War I War Measures Act. In Fort Frances Pulp and Paper v. Manitoba Free Press, the newspaper won because the court determined that whether the state of national emergency continued after the war was a political matter for Parliament. 1931: The Manitoba Free Press was renamed "Winnipeg Free Press". 1991: The Free Press moved to its current location in the Inkster Industrial Park, a $150 million plant at 1355 Mountain Avenue. 2001: In December, the Free Press and its sister paper, Brandon Sun, was bought from Thomson Newspapers by FP Canadian Newspapers Limited Partnership. At noon on Monday, October 13 (Thanksgiving Day) of 2008, about 1,000 members of the Communications, Energy and Paperworkers Union, which represents editorial, advertising, circulation and press staff, as well as newspaper carriers, launched a strike action. The strike ended 16 days later, when the union ratified the final offer on Tuesday, October 28. The contract was ratified by 67 per cent of newspaper carriers, 75 per cent of the pressmen and 91 per cent of the inside workers, including journalists. The recent five-year contract was negotiated, ratified, and signed in 2013, with no threat of a strike. Workers and managers negotiated directly with great success, without the need of a lawyer as previous contracts required. As of November 1, 2009, the paper ceased publishing a regular Sunday edition. In its place, a Sunday-only tabloid called On 7 was launched, but it is now discontinued. 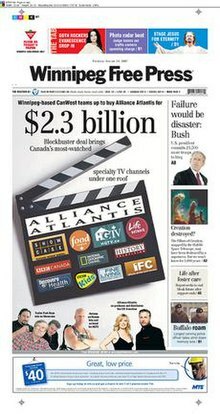 On March 27, 2011, the Sunday newspaper was retooled as a broadsheet format called Winnipeg Free Press SundayXtra, due to the impending arrival of Metro in the Winnipeg market. The Sunday edition is now only available online. According to Canadian Newspaper Association figures, the newspaper's average weekday circulation for 2013 was 108,583, while on Saturdays it was 144,278. Because of the relatively small population of Manitoba, this means that over ten percent of the population will look at the paper and the ads. The Winnipeg Free Press has seen like most Canadian daily newspapers a decline in circulation. Its total circulation dropped by 17 percent to 106,473 copies daily from 2009 to 2015. ^ "2015 Daily Newspaper Circulation Spreadsheet (Excel)". News Media Canada. Retrieved 16 December 2017. Numbers are based on the total circulation (print plus digital editions). ^ a b c d "HISTORY Winnipeg Free Press – Partners in Progress". Winnipeg Free Press. Retrieved 19 August 2012. ^ "Manitoba Act 1870". Canadahistoryproject.ca. Retrieved 19 August 2012. ^ "1874 Winnipeg's First Council Meeting". City of Winnipeg. Retrieved 19 August 2012. ^ a b c d e f g h i j k "Winnipeg Free Press (Manitoba Free Press)". Manitoba Historical Society. 19 November 2011. Retrieved 19 August 2012. ^ "Winnipeg Free Press strike continues". CBC News. 14 October 2008. Retrieved 19 August 2012. ^ "Free Press strike ends". Winnipeg Free Press. 29 October 2008. Retrieved 19 August 2012. ^ "Winnipeg Free Press strike ends". CBC News. 28 October 2008. Retrieved 19 August 2012. ^ "Free Press workers ratify new contract". Winnipeg Free Press. 15 April 2013. ^ "Sunday Free Press is bigger, better". Winnipeg Free Press. 26 March 2011. ^ "2013 Daily Newspapers Circulation Report" (PDF). Newspapers Canada. Retrieved 16 July 2014. ^ "Daily Newspaper Circulation Data". News Media Canada. Retrieved 16 December 2017. ^ "Daily Newspaper Circulation Data". News Media Canada. Retrieved 16 December 2017. Figures refer to the total circulation (print and digital combined) which includes paid and unpaid copies.